Sales organizations are now competing in a new world, where the buyer has more control than ever. Effective marketing programs that nurture the customer, score leads, and measure results are quickly becoming table stakes in almost every industry. That's where marketing automation comes in. But when it comes time to make the case for marketing automation, simple ROI tools aren't going to do the trick. Most ROI tools assume you’ve got people and process nailed down, so you'll simply need to optimize your funnel and gently tweak MQL, SAL, and SQL. We’ve learned that to prove marketing automation's necessity, you need to do more than calculate conversion rates. 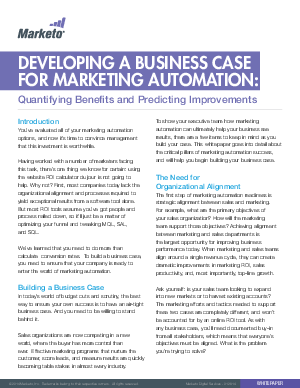 In this whitepaper, you'll learn how to demonstrate the case for marketing automation to your executive team. We'll help you build a solid business case with detailed explanations, metrics, and examples.